Hemphill County Courthouse Canadian Texas. Although formed in 1876 with over fifty other counties in the Panhandle and Southern Panhandle Plains, the area consisted primarily of ranches until the arrival of the railroad in 1886 which spawned the Hemphill County towns of Glazier, Canadian and Mendota in 1887. 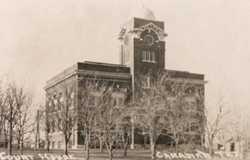 The county was officially organized in 1887 and the town of Canadian was chosen as the county seat. Named for its location on the south side of the Canadian River, residents from a settlement north of the river named Clear Creek (aka Hogtown,) relocated to the site of Canadian soon afterwards. 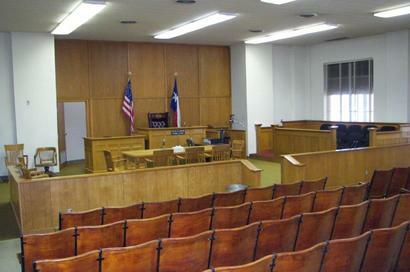 The county was named for Texas Supreme Court Justice John Hemphill. Hemphill was present at the Council House Fight in San Antonio in 1840 and also took part in the Somervell expedition in 1842. Hemphill was known as the �John Marshall of Texas� for the role he played in developing the state�s system of law. 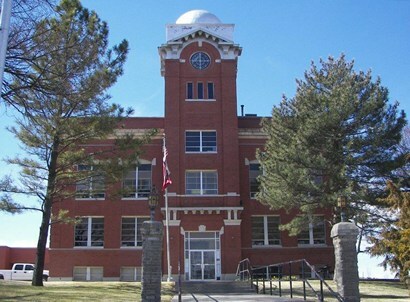 Hemphill County�s first courthouse was constructed in Canadian in 1887 and used for over twenty years. In 1890, a Wisconsin born architect from St. Louis, Robert G. Kirsch, designed a two-story red brick jail in Canadian, the first permanent public building in the county. It was used as a jail until 1982 and still stands behind the current courthouse. 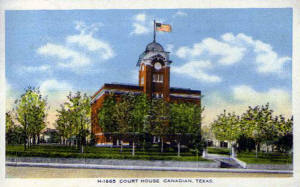 The second and current courthouse, built in 1909, was also designed by Kirsch. 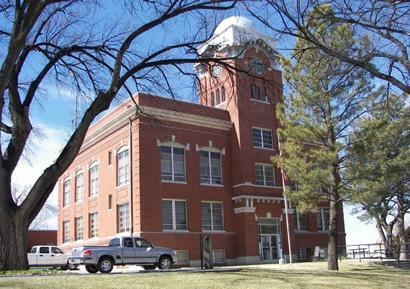 Along with courthouses in Wisconsin and Missouri, Kirsch also designed the 1908 Randall County courthouse in Canyon. 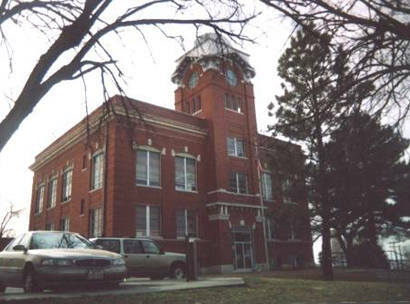 The 1909 Hemphill County courthouse was built of red brick in a Classical style with Italianate influences. 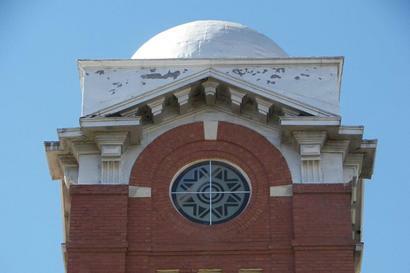 A central tower framed by brick pilasters looms over the front entrance, topped by bulls-eye windows, brackets, broken pediments with modillions and a small, silver dome. The building�s red brick is also accented by corbelling on the lower floors and by white limestone around the windows, around the front entrance and in the keystones over the top floor windows. 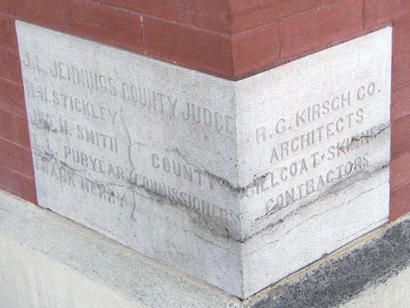 The original cost of constructing this courthouse was $31,278. 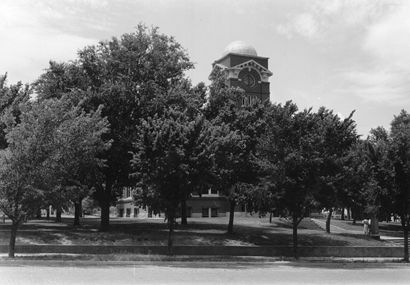 In 1964, a renovation replaced the original windows and doors with metal ones and a new jail was built and attached to the rear of the courthouse in 1982 using a similar color of red brick. Starting in 2011, the exterior of the 1909 courthouse received a major face-lift. Part of the renovation included the repair of the limestone sills, terra-cotta cornices, and cracks in the masonry. An interior restoration was still in progress in 2014.